Thickening hair and preventing a receding hair line is not impossible but it's tricky. However, there are numerous ways of disguising your thinning locks. The one that has worked brilliantly for me is Toppik Hair Building Fibers. If that's not for you, read Preventing and Disguising a Receding Hairline or Best Haircuts for a Receding Hairline. I've been trying out various hair loss concealers for about five years, but eventually I've settled on using Toppik on a day-to-day basis. I've experimented with expensive sprays like Hair-Cubed Microfiber spray and other hair building fibers that you sprinkle on to the thinning areas of your scalp, such as Mirage and Organin. For me Toppik provides the best compromise and in this article I'll talk you through what I've found to be the pros and cons of this particular product, teach you how to apply Toppik for the most natural and convincing results and explain why I use it over the alternatives. I've struggled with hair loss since my early twenties and tried a multitude of options to combat the problem. I've experimented with natural solutions like vitamins and organic shampoos. I've paid a lot of money on the FDA approved medications such as Minoxidil and Rogaine. I've even considered the drastic action of a hair transplant. But none of these seemed the right course of action for me. It's not that they weren't good. The vitamins and shampoos at least gave me a sense that I was taking action and I did notice a difference when using Minoxidil in conjunction with Propecia over an extended period. The trouble was the expense. Every month I was shelling out a lot of money. And the results took a long time. My main problem was the lack of confidence I was experiencing as a result of losing my locks so early on in life. I was paranoid that people were staring at me. What I desperately wanted was a solution in the here and now. That's when a friend of mine, who was going through similar problems, introduced me to an alternative. It wasn't going to stop my hair falling out. It wasn't going to reverse the onset of male pattern baldness. But what it would do was give me the appearance of a thicker head of hair and that was good enough for me. Organin Hair Thickening Fibers: Similar in many ways to Toppik but didn't look as natural and I found the effect of them would fade gradually during the day. Hair Cubed Microfiber Hair Thickener: A very effective solution that gives a really natural and convincing look, but way too expensive. Super Million Hair: Again, very much like Toppik and just as effective but comes at a higher price. Since I discovered Toppik I haven't looked back. It's an affordable alternative and an effective way of disguising my hair loss. What's great about Toppik is that it is suitable for men and women, gives a really natural finish and plumps up your existing healthy follicles to give the appearance of a much thicker, fuller head of hair. The natural micro-fibers in Toppik are made from keratin which is found in human hair. They adhere firmly to your existing hair with static electricity and cling to your follicles. The fibers form a layer of 'hair' and give the appearance of greater thickness and volume. Where Can I Get Cheap Toppik Hair Building Fibers? There are some great deals on Amazon on all colors and sizes of Toppik. I've found that's usually the cheapest way to buy this product although it is available from a host of other websites. So, Just How Good is Toppik? Toppik looks completely natural to the human eye. In fact you can't tell you're using it even from 2 centimetres away. It's entirely undetectable to others. It makes you look like you've got a full head of luscious, thick and healthy hair. For me, it greatly improved my confidence and made me less paranoid about my thinning locks. It's easy and convenient to apply and provides immediate results. Toppik hair building fibers are durable and stay binded to your hair all day, even through perspiration. The substance won't stain clothes or mark your skin. It will in no way hinder the growth of new hair. It's easily removed by showering and washing your hair. It won't break the bank as it's more affordable than the alternatives. There's a great range of tones and shades so you can match your exact hair color for the most natural appearance. There are complimentary products available to help you get the most out of the product. Having said that, although they help, you don't need them. I've tried most of them and I find that Toppik works extremely well by just spraying it into place with a normal styling spray. Toppik won't cure your hereditary hair loss. If you're genetically conditioned to do so, you'll continue to thin as before. It's merely a really effective hair loss concealer that will disguise your alopecia. As with any hair building fibers that you sprinkle on, there is a bit of wastage and a small amount of mess, but that is easily addresses with the wipe of a cloth on the area near to where you've applied Toppik. It is a recurring payment. Once you've run out, you'll need to replace Toppik. I usually buy the Economy size which tends to last me around two and half months. I've used Toppik for about four years now and this is the best way I've come up with of applying the fibers to my scalp and hair to give the most natural appearance. Make sure when buying Toppik that you choose the shade that is nearest to your natural color. 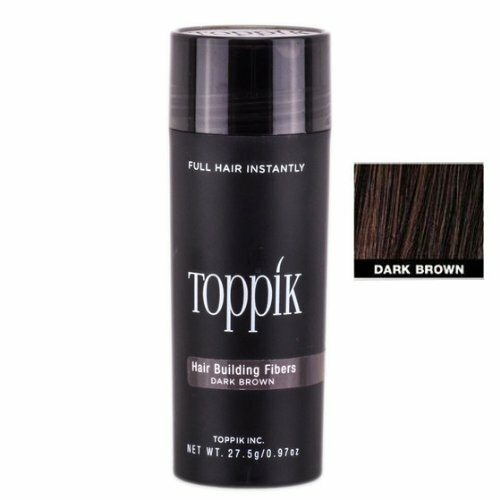 Wash and dry your hair thoroughly: Toppik works best on clean hair and it must be completely dry or the fibers merge and create a type of paste. Comb or brush through your hair, identifying the areas you need to apply Toppik to (where your hair is thin or balding). Hold the tube about five centimetres away from your head. Very gently shake the substance onto the specific areas of thinning until they are covered with the sprinkles. Don't overdo it or you'll find that the fibers become obvious and don't look as natural. Spray the hair all over to secure the fibers and ensure they are clinging to your hair. Style the hair as normal. If you have used your hands to apply gel or another styling product after using Toppik, you will need to wash you hands as there may be traces of the substance on them. Once you've mastered how to apply Toppik, go out and enjoy life with confidence! Does Biotin for Baldness Work?